First Ascent: 1914 D. Brown, E. W. Harnden, L. Nettleton, and E. Parson. This peak is #64 on the Height List for British Columbia .Eyebrow Peak is located west of Horsethief Creek, east of Birthday Peak, and directly north of the Starbird Glacier in the Stockdale Group. Labelled on 1:50K. Marked with red cross on BC Basemap. It is a prominent mountain which is bordered on the south by the Starbird Glacier, and on the north by the Stockdale Glacier, both quite large for this region. 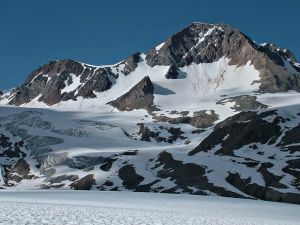 The Southern Purcells Grand Ski Traverse approaches from the north up an unnamed drainage to gain the Stockdale Glacier, then passes between Eyebrow and Birthday Peaks. It then drops onto the Starbird Glacier and continues on to Glacier Dome. The usual access for Eyebrow Peak is via Starbird Pass (best approached from the west). The best ascent route is probably on snow as the rock in the area is extremely loose and unpleasant. Name Notes: Wheeler originally named Farnham Peak as "Eyebrow". However the name was moved to this peak when Peter Robinson proved that Wheeler must have been looking at Farnham. Wheeler had called it Aurora. When Wheeler was in the area weather was poor when he named Eyebrow because of distinctive eyebrow features. However, Professor Peter Robinson suspected this so with better knowledge of the area and by taking the same sightings as Wheeler virtually proved that Wheeler saw Farnham when he explaind the eyebrow features. Eyebrow was then moved to this peak. 3 major routes were climbed from the July 1928 ACC summer camp called "Thunder Camp".